Cable rows are a good supplemental lift to finish off your back training. A great back workout finisher, cable rows allow you to exhaust muscle groups that may not be fully engaged in the bigger primary back exercises. For maximum effect, really squeeze your shoulder blades together at the end of the lift. 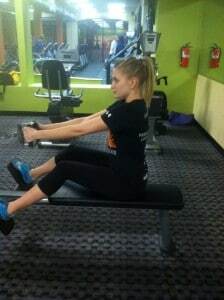 Equipment: Seated cable row station. Foot Position: Plant your feet on the station’s foot pegs, and sit with a slight bend in your knees. Hand Position: You can use a variety of attachments with different grips for a different stimulus. However using a narrow handle with a neutral grip (palms facing each other) allows you to really squeeze your shoulder blades together at the end of the movement to engage your traps and rhomboids decisively. Begin with your arms extended and lats fully stretched. Initiate the movement with a strong pull from your lats. Continue pulling the handlebars in until they touch your abdomen. Finish the lift by squeezing your shoulder blades together tightly. Lower the plates extending your arms and getting a full stretch again in your lats before starting the next repetition. Use a weight you can completely control each repetition without moving your torso forward and back to create momentum. Cable Rows are a supplemental exercise, and is best used with moderate weights and higher reps. For maximum effect use a weight you can control through the full range of motion for a relatively high rep range so that you can thoroughly fatigue all of the muscle groups in your back. Using excessive momentum: Leaning forward and swinging your torso back to create upper body momentum to complete heavy reps reduces the effectiveness of this lift. Slight movement to complete additional reps at the end of a set can still be effective. Cable rows are a relatively low impact lift. That being said, always use a weight you can complete your reps with proper technique. Wide Grip Cable Rows: Using different grips can provide a different training stimulus.